To those looking for an e-reader –- you may already have one. 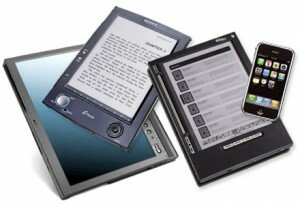 E-reader software has allowed electronic books to be read on mobile phones for some time. Now, Chronicle Books, together with Mobifusion, have partnered to provide Chronicle content exclusively to mobile phones. Seven of the publisher’s titles on health and sexuality that were originally printed as decks of 50 information cards have been digitized specifically for display on mobile phones. You may also soon be able to read the paper in between levels of “Mario Kart.” Nintendo CEO Satoru Iwata has hinted that an e-reader application may soon be available for the company’s popular 3DS handheld gaming console. Using the device’s wireless connection, players could access magazine and newspaper articles and read them on the dual screen. E-books can already easily be read on a computer. However, the line between a computer and an e-reader will blur further with the release of Toshiba’s new dual-screen netbook. The two 7” displays allow the device to double as an e-reader that opens and closes like a book. The computer will retail for $1,099 and be available in this summer. And, of course, there’s the iPad and other tablet computers, for which e-reading is one of many possible functions. Are efforts to provide e-book content on devices consumers already own (or are likely to purchase) diminishing demand for dedicated e-readers? According to a recent study by Accenture as reported by the German news site Börsenblatt, only three percent of Germans have a desire to purchase a dedicated e-reader. The demand for e-readers was higher in the United States and other countries, but not by much –- around 5% of all other respondents wanted to purchase one. Barnes & Noble introduced a cheap $149 e-reader this morning to compete in the market, and to entice new customers into the e-book world. The optimal sub-$150 price (and the retention of key features) should make the readers considerably more attractive to consumers, and Barnes & Noble will most likely increase their presence in the e-reader marketplace. But in the battle between e-readers and a whole world of other electronic reading options, it may come down to pure preference. It will depend on whether the customer wants a new device specifically made for reading, or the device he already has in his pocket, handbag, or hand.